It's the muguet session again. The late April in France is the collecting and selling session for muguet. People buy it to offer to friends, family and colleagues on the labour day (1 May). Well, this year I'm going to join the collecting activities. It's a contract for 5-7 days depending on the weather and the progress. It's cool to have a job that you just call, and they asked you to come in with the necessary documents, without asking about your experience. The farm is one hour from my place, so have to wake up super early in the morning. I hope my old body can support the work in a farm. 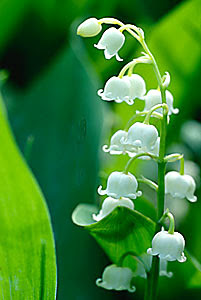 Have fun collecting the muguet! Gives you the chance to enjoy the weather and nature, not to mention practicing your French! Too bad about the early start but at least the weather has been good lately! We are actually not allowed to talk, as we need to count the amount of muguet we collect and tie it with rubberbend. The weather has been nice, but too hot for the muguet so they don't let us pick muguet in the afternoon. This afternoon we collected the leaves, it was too hot to work under the sun.